Hvar, one of the sunniest islands in the Mediterranean, has become one of the top island destinations in the world. Hvar belongs to the central island group of the Adriatic, located between Brac and Korcula. 1. Hotel Amfora Hvar - Tucked into a tranquil bay, surrounded by a lush pine grove, and only a short ten-minute walk from the historic city of Hvar, hotel Amfora is the most exciting new resort on the Adriatic. With its state-of-the-art conference facility, diverse amenities and a beautiful private beach, hotel Amfora is ideal for family vacations, team building and large conferences. 2. Hotel Riva Hvar - Hovering on the waterfront promenade in the heart of the medieval Hvar Town, Riva – Hvar Yacht Harbor Hotel, Croatia´s first and only member of Small Luxury Hotels of the World, offers you the finest in Adriatic ambiance. Completely reconstructed in 2006 incorporating a beautiful 100-year-old building, Riva brings together the best of both worlds: old world charm and state of the art luxury. 3. Hotel Pharos a hotel with a magnificent view overlooking Hvar bay and the Devil islands (Paklenjaci). Sunbathe on the pool terrace and enjoy the relaxing ambient of a nearby olive garden. Hvar has a very mild Mediterranean climate, which along with its beautiful beaches and Mediterranean vegetation make it one of the most attractive tourist centers in Europe. Hvar is known for its fields of lavender which is traditionaly grown on the island, as well as its rich wineyards and excellent wine. Hvar - A small town with the same name as the island, and is the largest town on the island. As a site of the first open city theater in Europe it is a town of rich cultural heritage. Even today there are numerous art galleries, museums and exhibitions in the town. Hvar has a century old hotel and wellness tradition. Lovely hotel Delfin is located right next to the sea and its guests specially love the big terrace overlooking the sea and moored boats. 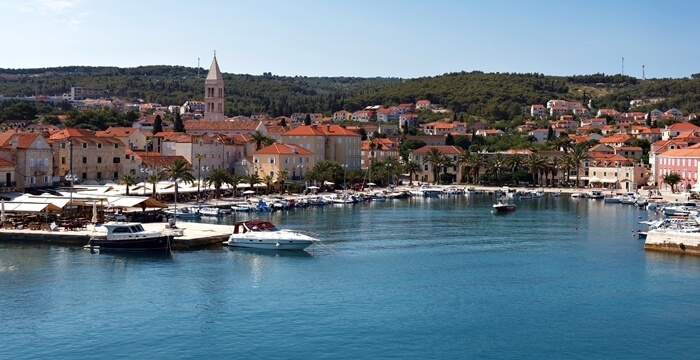 Jelsa - Is a small town and port located at the north coast of the island of Hvar with a century old tourist tradition. The town is known for its vineyards, olive and pine trees. Jelsa is an important tourist center with a long and rich tradition. Jelsa offers plenty of sports and recreational facilities, like tennis courts, mini golf, bowling and more. Best known hotel in this town is Adriatiq hotel Hvar***, but if your are more inclined to private accomodation make sure you check out Hvar No Name apartments. offer a wide selection of rooms. Resort Trim is a place to visit in case you love staying in bungalows. Vrboska - The smallest place on the island, founded in the 15th century near town Jelsa. Sometimes reffered as “little Venice”, due to its many bridges, it is a very picturesque town worth seeing. Quite close to Vrboska you will find Resort Senses, surrounded with beautiful mediterranean pine tree forest. We offer total 321 facilities.